ILLNESS AND WANDERINGS OF IZDUBAR. Heabani and the trees.—Illness of Izdubar.—Death of Heabani.—Journey of Izdubar.—His dream.—Scorpion men.—The Desert of Mas.—The paradise.—Siduri and Sabitu.—Urhamsi.—Water of death.—Ragmu.—The conversation.—Hasisadra. OF the three tablets in this section, the first one is very uncertain, and is put together from two separate sources; the other two are more complete and satisfactory. the fragment appears to refer to the illness of Izdubar I think it belongs here. 1. to his friend . . . .
2 and 3 . . . .
4. thy name . . .
6. his speech he made . . . .
7. Izdubar my father . . . .
8. Izdubar . . . .
10. joined . . .
12. said to . . . .
13. I join him . . . .
14. in the . . . .
15. the door . . . .
16. of. . . .
17 and 18. . . .
19. in. . . .
20. Heabani . . . . carried . . .
21. with the door . . . . thy . . .
22. the door on its sides does not . . .
23. it has not aroused her hearing . . .
24. for twenty kaspu (140 miles) it is raised . . .
25. and the pine tree a bush I see . . .
26. there is not another like thy tree . . .
27. Six gars (120 feet) is thy height, two gars (40 feet) is thy breadth . . . .
28. thy circuit, thy contents, thy mass . . .
29. thy make which is in thee in the city of Nipur . . . .
30. I know thy entrance like this . . .
31. and this is good . . .
32. for I have his face, for I . . .
33. I fill . . . .
34. . . . .
35. for he took . . .
36. the pine tree, the cedar, . . .
37. in its cover . . .
38. thou also . . . .
39. may take . . .
40. in the collection of everything . . .
41. a great destruction . . .
42. the whole of the trees . . .
43. in thy land Izmanubani . . .
44. thy bush? is not strong . . .
45. thy shadow is not great . . .
46. and thy smell is not agreeable . . .
47. The Izmanubani tree was angry . . .
49. like the tree . . . The second, third, fourth and fifth columns appear to be entirely absent, the inscription reappearing on a fragment of the sixth column. 1. The dream which I saw . . . .
2. . . . made? the mountain . . . .
3. he struck . . . .
4. They like nimgi struck . . . .
5. brought? forth in the vicinity . . . .
6. He said to his friend Heabani the dream . . .
7. . . . good omen of the dream . . . .
8. the dream was deceptive . . . .
9. all the mountain which thou didst see . . . .
10. when we captured Humbaba and we . . . .
11. . . . of his helpers to thy . . . .
12. in the storm to . . . .
14. at thirty kaspu he made a halt? 15. in the presence of Shamas he dug out a pit . . . .
16. Izdubar ascended to over . . . .
17. by the side of his house he approached . . . .
18. the mountain was subdued, the dream . . . .
19. he made it and . . . .
1. The mountain was subdued, the dream . . . .
2. he made it and . . . .
3. . . . turban? . . . .
4. he cast him down and . . . .
5. the mountain like corn of the field . . . .
6. Izdubar at the destruction set up . . . .
8. and in the midst of his limbs he died. 12. God will not depart, why do my limbs burn. 15. He invoked the god of the earth and desired death. 18. and came out the shadow of death. 21. . . . and in the desert thy lord was proceeding. 22. And Heabani the dream considered and said to Izdubar. The fourth and fifth columns of this tablet are lost. This part of the legend appears to refer to the illness of Izdubar. 1. My friend . . . the dream which is not . . .
2. the day he dreamed the dream, the end . . .
3. Heabani lay down also one day . . .
4. which Heabani in that evening . . .
5. the third day and the fourth day which . . .
6. the fifth, sixth, seventh, eighth, ninth . . .
7. when Heabani was troubled . . .
8. the eleventh and twelfth . . .
9. Heabani in that evening . . .
10. Izdubar asked also . . .
11. is my friend hostile to me . . .
12. then in the midst of fight . . .
13. I turn to battle and . . .
14. the friend who in battle . . .
15. I in . . . . . . It must here be noted that my grounds for making this the eighth tablet are extremely doubtful, it is possible that the fragments are of different tablets; but they fill up an evident blank in the story here, and I have inserted them pending further discoveries as to their true position. In the first column Heabani appears to be addressing certain trees, and they are supposed to have the power of hearing and answering him. Heabani praises one tree and sneers at another, but from the mutilation of the text it does not appear why he acts so. I conjecture he was seeking a charm to open the door he mentions, and that according to the story this charm was known to the trees. The fragment of the sixth column shows Heabani unable to interpret a dream, while Izdubar asks his friend to fight. After this happened the violent death of Heabani, which added to the misfortunes of Izdubar; but no fragment of this part of the story is preserved. This tablet is in a somewhat better state than the others, and all the narrative is clearer from this point, not a single column of the inscription being entirely lost. The ninth tablet commences with the sorrow of Izdubar at the death of Heabani. 2. bitterly lamented, and lay down on the ground. 5. death I feared, and lay down on the ground. 8. to the neighbourhood of the mountains I took at night. 9. a dream I saw, and I feared. 12. and they sent peace unto me. 13. . . . . . . dream. 14. . . . . . Sin, erred in life. 15. precious stones . . . to his hand. 19. and. . . .
20. he threw . . . .
21. he was guarded . . .
22. the former name . . . .
23. the new name . . . .
24. he carried . . . .
25. to. . . .
1. Of the country hearing him . . . .
2. To the mountains of Mas in his course . . . .
3. who each day guard the rising sun. 5. under hell their feet were placed. 8. the might of his fear shook the forests. 9. At the rising of the sun and the setting of the sun, they guarded the sun. 10. Izdubar saw them and fear and terror came into his face. 11. Summoning his resolution he approached before them. 20. . . . . of which the passage is difficult. The rest of this column is lost. In it Izdubar converses with the monsters and where the third column begins he is telling them his purpose, to seek Hasisadra. 3. He Hasisadra my father . . . . .
8. Do it not Izdubar . . . .
9. of the country . . . .
12. to the rising sun . . . .
13. to the setting sun . . . .
14. to the setting sun . . . .
15. he brought out . . . . In this mutilated passage, the monster describes the journey to be taken by Izdubar; there are now many lines wanting, until we come to the fourth column. 1. in prayer . . . .
2. again thou . . . .
3. the monster . . . .
4. Izdubar . . . .
5. go Izdubar . . . .
6. lands of Mas . . . .
7. the road of the sun . . . .
8. 1 kaspu he went . . . .
10. he was not able to look behind him. 11. 2 kaspu he went . . . . This is the bottom of the fourth column; there are five lines lost at the top of the fifth column, and then the narrative reopens; the text is, however, mutilated and doubtful. 6. 4 kaspu he went . . . .
8. he was not able to look behind him. 9. 5 kaspu he went . . . .
11. he was not able to look behind him. 12. 6 kaspu he went . . . .
14. he was not able to look behind him. 15. 7 kaspu he went . . . .
17. he was not able to look behind him. 18. 8 kaspu he went . . . . turned? . . . .
20. he was not able to look behind him. 29. . . . . beautiful situation . . . .
30. to the forest of the trees of the gods in appearance it was equal. 33. Ukni stones it carried as shoots? 1. the pine tree . . . .
2. its nest of stone . . . . ukni stone? 2. dwelt also . . . .
3. making a dwelling, making . . . .
4. covered with stripes of affliction in . . . .
5. Izdubar struck with disease . . . .
6. illness covering his . . . .
7. having the brand of the gods on his . . . .
8. there was shame of face on . . . .
9. to go on the distant path his face was set. 11. spake within her heart, and a resolution made. 14. There is no one upright in . . . .
15. And Sabitu saw him and shut her place? 16. her gate she shut, and shut her place? 18. he struck his hands and made . . . .
20. Sabitu why dost thou shut thy place? 21. thy gate thou closest . . . .
22. I will strike the . . . . The rest of this column is lost, but I am able to say it described the meeting of Izdubar with a boatman named Urhamsi, and they commence together a journey by water in a boat on the second column. [paragraph continues] Very little of this column is preserved; I give two fragments only here. 2. Why should I curse thee . . . .
3. and thy heart is tried . . . .
4. there is shame of face on . . . .
5. thou goest on the distant path . . . .
6. . . . . burning and affliction . . . .
7. . . . . thus thou . . . .
9. . . . . my hand has not . . . .
10. . . . . my heart is not . . . .
11. . . . . shame of face on . . . . Here again there are many wanting lines, and then we have some fragments of the bottom of the column. Here there are many lines lost, then recommencing the story proceeds on the third column. 1. the friend whom I loved . . . .
2. I am not like him . . . .
4. Again Ur-hamsi why . . . .
5. what brings (matters) to me if it . . . .
8. Thy hand Izdubar ceases . . . .
9. thou hidest in the place of the stones thou . . .
10. in the place of the stones hidden and they . . .
11. Take Izdubar the axe in thy hand . . . .
12. go down to the forest and a spear of five gar . . .
13. capture and make a burden of it, and carry it . . .
15. took the axe in his hand . . . .
16. he went down to the forest and a spear of five gar. . . .
19. the ship the waves took and they . . . .
21. took Urhamsi the waters of death . . . .
2. the tablets? Izdubar . . .
3. Let not the waters of death enclose thy hand. . . .
4. the second time, the third time, and the fourth time Izdubar was lifting the spear . . . .
5. the fifth, sixth, and seventh time Izdubar was lifting the spear . . . .
6. the eighth, ninth, and tenth time Izdubar was lifting the spear . . . .
7. the eleventh and twelfth time, Izdubar was lifting the spear . . . .
9. and he broke his girdle to . . . .
10. Izdubar seized the . . . . . . .
11. on, his wings a cord he . . . .
13. spake within his heart and a resolution made. 16. is not ended the voyage . . . .
17. the man is not come to me and . . . .
18. I wonder he is not . . . . .
19. I wonder he is not . . . .
20. I wonder . . . .
IZDUBAR, COMPOSITE FIGURES, AND HASISADRA (NOAH) IN THE ARK; FROM AN EARLY BABYLONIAN CYLINDER. guard, by whom Izdubar had to pass in going to reach Hasisadra. It is curious that, whenever Izdubar speaks to this being, the name Ragmua is used, while, whenever Izdubar is spoken to, the full name Ragmu-seri-ina-namari occurs. Where the story re-opens Izdubar is informing Ragmu of his first connection with Heabani and his offers to him when he desired him to come to Erech. 1. for my friend . . . .
2. free thee . . . .
3. weapon . . . .
4. bright star . . . .
3. the kings of the earth shall kiss thy feet. 5. and I after thee will take all . . . .
6. I will clothe thy body in raiment and . . . .
8. his fetters loosed . . . . The speech of Ragmu to Izdubar and the rest of the column are lost, the narrative recommencing on Column V. with another speech of Izdubar. 2. . . . . my presence? 7. Heabani my friend . . . . the same. 8. No one else was with us, we ascended the mountain. 9. We took it and the city we destroyed. 10. We conquered also Humbaba who in the forest of pine trees dwelt. 11. Again why did his fingers lay hold to slay the lions. 12. 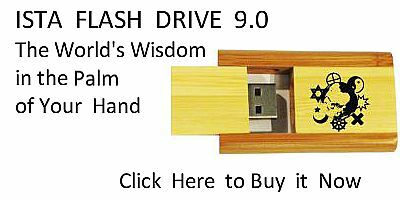 Thou wouldst have feared and thou wouldst not have . . all the difficulty. 19. he broke? and destroyed his defence? . . . .
20. he was cut off and given to pour out? . . . . Here the record is again mutilated, Izdubar further informs Ragmu what he did in conjunction with Heabani. Where the story reopens on Column VI. [paragraph continues] Izdubar relates part of their adventure with Humbaba. Here again our narrative is lost, and where we again meet the story Izdubar has spoken to Hasisadra and is receiving his answer. 1. I was angry . . . .
3. Whenever brothers fixed . . . .
4. Whenever hatred is in . . . .
5. Whenever the river makes a great flood. 6. Whenever reviling within the mouth . . . .
8. from of old was not . . . .
10. of death the image has not been seen. 12. the spirit of the great gods takes his hand. 15. of death the day is not known. This statement of Hasisadra closes the tenth tablet and leads to the next question of Izdubar and its answer, which included the story of the Flood. The present division of the legends has its own peculiar difficulties; in the first place it does not appear how Heabani was killed. My original idea, that he was killed by the poisonous insect tambukku, I find to be incorrect, and it now appears most likely either that he was killed in a quarrel with Izdubar, as seems suggested by the fragment in p. 246, or that he fell in an attempt to slay a lion, which is implied in the passage p. 259.
the scorpion is said to belong to the eighth month, in which, of course, it should naturally appear. This assists in explaining a curious tablet printed in "Cuneiform Inscriptions," vol. iii. p. 52, No. 1, which has been misunderstood. This tablet speaks of the appearance of comets, one of which has a tail "like a lizard (or creeping thing) and a scorpion." 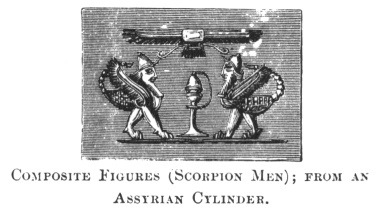 COMPOSITE FIGURES (SCORPION MEN); FROM AN ASSYRIAN CYLINDER. feathers like precious stones, seen by Izdubar on his journey. I have altered my translation of the passage in pp. 255, 256, which I now believe to relate that Izdubar at the direction of Urhamsi made a spear from one of the trees of the forest before going across the waters of death which separated the abode of Hasisadra from the world of mortals. I do not, however, understand the passage, as from the mutilated condition of the inscription it does not appear what he attacked with it.